Significant concrete issues have been found in potentially thousands of locations along the second phase of the $2.7 billion Silver Line Metro extension in Northern Virginia, project officials say. The issues are raising serious questions about the durability of concrete and quality control in the largest transportation project in the region. The 11.4-mile extension of the Metro system will bring Metrorail to Reston Town Center, Dulles International Airport and Loudoun County for the first time, but now project leaders are scrambling to fix nearly 2,000 areas of concern before the first train rolls. While the project will eventually be turned over to Metro, it is being built by the Metropolitan Washington Airports Authority (MWAA). The U.S. Department of Transportation inspector general is now looking into the issue. The largest worry at the moment has to do with concrete panels that serve as walls for the new Metro stations. In some cases, the water-to-cement ratio is off, the steel inside the panels is not covered by enough concrete and there are insufficient safeguards for water to expand and contract. In all of these cases, water could penetrate the panels, leading to cracking and rusting. "I would say that everyone's got a heightened awareness of quality on the project," Charles Stark, the head of MWAA's Dulles Corridor Metrorail Project, told News4. Project leaders identified 1,750 panels produced by Universal Concrete Products of Stowe, Pennsylvania, as areas of concern. Those panels have been installed at every station along the new phase of the project except the Dulles International Airport station. It wasn't until after installation that quality-control personnel spotted the issues during subsequent inspections. Stark said the issue should have been identified before the panels were installed. "I would say that the primary quality control responsibility is [that of] the contractors," Stark said. "They need to have the people go to these [subcontractor] plants periodically and make sure things are being done properly." Inspectors later found that equipment at Universal Concrete's facility was not properly calibrated, and a change from a manual method of checking water-to-cement ratio to an automatic machine-based method caused the issue. "The water-to-cement ratio had a little too much water in it," said Stark. "We don't know exactly how many of the panels were cast with an unacceptable water to cement ratio." In addition, a process known as air entrainment, which intentionally creates tiny air bubbles in concrete, was insufficient. That process is important because it allows freezing water to expand into the air bubbles to prevent cracking. Project officials said 115 concrete panels are being tossed out completely and replaced. The remaining panels will be treated with a transparent solution called a silane coating. This coating is expected to prevent water from entering the concrete, but it will have to be applied to the 1,750 panels every 10 years in order to do so. The contract for the Silver Line requires concrete durability of 100 years. Officials said without taking action, that durability level will not be met. "This is about to begin -- the contractor will coat all of the station panels with the silane," Stark said. "It's our responsibility as the Airports Authority to make sure that the facility we turn over to the Washington Metro will last 100 years." In addition to issues with the concrete panels, quality control agents recently also found 110 locations where connections to concrete support beams for stations are cracking. The cracking in this case is occurring because of insufficient protection from freezing water. The solution is to use a pressurized grout as added protection. Capital Rail Constructors, the lead contractor, is being required to fix this issue. "These kinds of problems do crop up. I wouldn't say they are normal, but they do occur," said Stark. MWAA head Jack Potter told NBC4 where concrete has been an issue, problems are being fixed. "Our quality control system is working, and, ultimately, we will deliver a safe, reliable and durable project," Potter said. Metro told NBC4 it is aware of the concrete issues and has reached an agreement with MWAA and the contractor on a long-term fix, including future maintenance. "We continue to work with the parties involved to ensure that Metro does not incur future expenses related to the concrete panels," Metro spokesperson Sherri Ly wrote in an email. The revelations about these concrete issues are coming to light after a Freedom of Information Act request by NBC4. Asked about any possible long-term effects on the strength of the project, Stark said he believes the Silver Line is structurally sound. "I believe that's true -- and in the abundance of caution, I've made sure that my people deal with all of these issues to determine right out of the box whether there is a potential structural issue," he said. The second phase of the Silver Line will extend 11.4 miles from Reston to Dulles International Airport and into Loudoun County. There will be six stations along the second phase: Reston Town Center, Herndon, Innovation Center, Dulles International Airport, Loudoun Gateway and Ashburn. The price tag for the project is $2.7 billion. 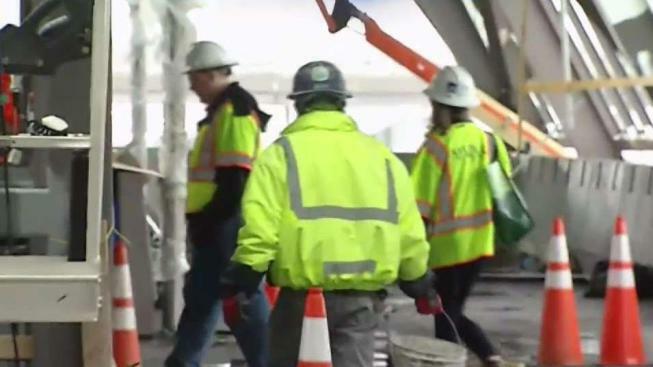 While the project will eventually be turned over to Metro, it is being built by the Metropolitan Washington Airports Authority, also known as MWAA. MWAA selected Capital Rail Constructors as the lead contractor to build the project. Capital Rail Constructors is a joint venture between Clark Construction Group, LLC, and Kiewit Infrastructure South Company. Capital Rail Constructors selected Universal Concrete Products of Stowe, Pennsylvania, as a subcontractor for the pre-cast panels that were found to be faulty and installed in the stations. Repeated calls and emails to Universal Concrete Systems have not been returned. Despite the ongoing concrete issues, the head of the Silver Line project does not anticipate a significant delay. Substantial completion had been set for Aug. 7, 2019. The contractor is projecting an eight-day delay. Capital Rail Contractors would not specify the exact cost associated with the faulty concrete, but in all cases either they or the subcontractor is absorbing the costs of the mistakes. This is not the first time the Silver Line extension has dealt with cracking concrete. In 2015, 60 support girders for Dulles International Airport’s aerial Metro station cracked. Those cracks were up to 18 inches long and several inches wide. They were visible to the naked eye. Those girders were produced by Coastal Pre-cast Systems of Chesapeake, Virginia. Project leaders say the girders were fixed about a year and a half later and are now 100 percent structurally sound. Project leaders now say there is a heightened awareness about concrete issues on the project and that quality council meetings have begun with the contractor for a higher level of communication. None of the contractors in question were terminated from the project.